Railroad posters rock. Such great artwork! I have not been able to find this reproduction anywhere. Any thoughts? 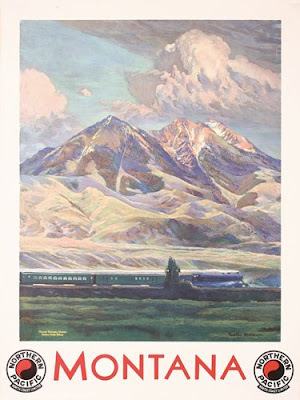 It's been a long time since I've seen reproductions of the old Northern Pacific prints for sale locally, but there are still a couple of places offering current reprints of this poster on eBay. I imagine they're "giclée" prints (produced on demand with a high-quality computer printer) ... I couldn't vouch for their quality, but they should be pretty good, and they're fairly reasonably priced.